The greater palatine nerve (GPN), which is the continuation of the descending palatine nerve, innervates palatal tissues and the palatal gingiva posterior to the canines after passing through the greater palatine foramen. Anesthetising the GPN (i.e., GPN block) at the greater palatine foramen is common during procedures on the maxillary teeth and palate. The greater palatine canal also provides access for maxillary anesthesia in dental practice.1 Studies have suggested that the greater palatine neurovascular bundle is the most critical structure to be identified during subepithelial connective tissue palatal graft procedures.2 Multiple studies in clinical practice have demonstrated that a GPN block produces the most effective, consistent and prolonged analgesia following palatoplasty in children with cleft palate.3 Although a number of studies have shown anatomical variations in greater palatine foramen location, number and morphology,4,5 studies describing anatomical variations in the GPN within and outside the canal are sparse. Classically, the GPN is thought to descend through the greater palatine canal as a single trunk accompanied by the descending palatine artery.2 After its exit from the foramen, the nerve splits into numerous branches between the osseous roof of the palate and the mucoperiosteum to supply sensory and secretory fibres to the major part of the mucous membrane of the hard palate and palatal gingivae as far as the premaxillary palatine mucosa. Any anatomical variations in the nerve or its branching may have implications for the surgeons and anesthesiologists working in the area. We describe 4 anatomical variations in the normal branching pattern of the GPN in the canal and discuss the implications for clinical practice. Twenty (20) well-embalmed cadaveric hemi-sectioned heads (11 male, 9 female) were dissected for study purposes at the University of Western Ontario's Schulich School of Medicine and Dentistry. * None had anatomical deformities. Sectioning was carried out to ensure intact hard palate mucosa and nasal septum in each specimen. After localization of the greater palatine foramen by blind needle insertion, the greater palatine neurovascular bundle was exposed by making a transverse incision through the full thickness of the palatal mucosa just behind the point of needle entry. An anterior flap of the mucoperiosteum was then raised laterally to the alveolar margin, with the help of a blunt periosteal elevator. 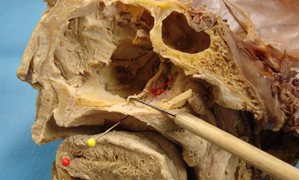 Careful blunt dissection of the neurovascular bundle was performed to separate the nerve and vessels from the surrounding connective tissue near the greater palatine foramen. Blunt dissection of the hard palate mucosa was also performed to observe the branching pattern of the GPN as it traveled anteriorly from the molar region toward the mucosa covering the incisive fossa behind the maxillary incisor teeth. After removal of the bony septum and the lateral wall of the nose using a chisel and hammer, the GPN was successfully traced superiorly within the greater palatine canal and pterygopalatine fossa. The greater palatine artery was identified as a tortuous structure lying anterior to the nerve in the pterygopalatine fossa in 19 specimens and as a single neurovascular bundle behind the maxillary antrum in 1 case. The greater palatine artery was tied with a thread to distinguish it from the greater palatine nerve and its branches. We noted that 8 of the 20 GPN specimens had variations in the branching pattern within the canal. They were photographed and separated into 4 types. In 12 of the 20 specimens, the GPN exited through the foramen as a single slender trunk that, as it proceeded anteriorly within the mucosal tissue lying medial to the maxillary premolars, divided into 2 or 3 major branches, which divided further into smaller branches (Fig. 1a). These smaller branches finally intermingle with the branches of the nasopalatine nerves within the mucosa. In the remaining 8 specimens (40%), 5 male and 3 female, the GPN emerged from the foramen as 2 or more trunks. The trunks traveled anteriorly to further divide normally within the mucosa of the hard palate. In all 8 cases, all branches were confined to the greater palatine canal. However, after emerging from the greater palatine foramen, the distribution of these branches did not follow a normal course, but lateral branches traveled more laterally and medial branches traveled more medially, branching anteriorly along their course. We observed 4 patterns of intra-canalicular branching (Table 1). In 2 specimens (10%), 2 distinct trunks were noted within the canal, both trunks giving rise to 2 slender branches close to the greater palatine foramen. In 4 specimens (20%), the nerve divided into 2 trunks within the canal exiting the foramen as a thick lateral trunk and a slender medial trunk. In 1 specimen, the nerve divided into 3 slender trunks after emerging from the sphenopalatine ganglion (Fig. 1b). In another case, the nerve divided into 2 trunks within the canal, each giving rise to 2 thread-like branches resulting in 4 such branches exiting the greater palatine foramen (Fig. 1c). In the most common variation (4 cases), the nerve exited the greater palatine foramen in the form of a thick lateral trunk and a slender medial trunk (Fig. 1d). Both of these trunks later ramified extensively within the mucosa of the hard palate. Table 1 Summary of branching patterns in the greater palatine nerve found in 8 of 20 examined specimens. Figure 1: Anatomical variations in the branching of the greater palatine nerve (GPN) in the greater palatine canal. NOTE: To view the labels for each Figure, please hover your cursor over each image and they will appear. (a) Normal anatomy, in which the GPN has a single trunk. (b) The GPN as three slender trunks exiting the greater palatine foramen. (c) Two trunks of the GPN exiting the greater palatine canal and each further dividing into two branches in the mucosa. (d) The GPN as a thick lateral trunk and a slender medial trunk. Note: Ant = anterior direction, GPA = greater palatine artery, GPN = greater palatine nerve, M = mucosa of the hard palate, Post = posterior direction, T = tongue. Unlike the GPN, the greater (descending) palatine artery did not show much variation in its course as it exited the greater palatine foramen. In 6 out of 8 specimens, the vessel ran superior to the nerve and closely adhered to the bony vault of the hard palate. In 1 specimen, the artery exited the foramen lying inferior to the nerve trunks, but then wound around the neurovascular bundle and became superior to the nerves. In the other specimen, the vessel ran parallel to the medial trunk of the nerve. This study may have further implications in terms of maxillary anesthesia.13 The position of the artery close to the branches might explain the high incidence of epistaxis and intraneural injections14 and should be considered when accessing the greater palatine canal. Multiple branches of the GPN may lie in the path of a needle used to induce maxillary block through the greater palatine canal, thus increasing the possibility of paresthesia and nerve injury. The occurrence of single anatomical variations in the course of the greater palatine artery after its exit from the greater palatine foramen needs further evaluation in a larger sample. Interference in the fusion of the palatine bone with the maxilla during embryonic development, similar to that reported for the mandibular canal,15 could result in variations in the branching of nerves or the course of blood vessels. To conclude, anatomical variations in branching of the GPN may occur, with or without associated anatomical variations in the associated blood vessels. Knowledge of such variations may have important implications in terms of improving the safety of surgical procedures performed around the palate, nose and maxilla. * All cadaveric specimens were obtained with permission from the body bequeathal program at Western University (London, Ontario), in accordance with the Anatomy Act of Ontario and Western's Committee for Cadaveric Use in Research. Dr. Hafeez is a clinical anatomy graduate student, department of anatomy and cell biology, University of Western Ontario, London, Ontario and a clinical lecturer, Princess Nourah bint Abdulrahman University, Saudi Arabia. Dr. Sondekoppam is assistant professor, department of anesthesia and perioperative medicine, London Health Sciences Centre, University Campus, University of Western Ontario. Dr. Johnson is assistant professor, department of anatomy and cell biology, University of Western Ontario, London, Ontario. Dr. Merrifield is associate professor, department of anatomy and cell biology, University of Western Ontario, London, Ontario. Dr. Galil is professor of dentistry, department of periodontics, orthodontics and clinical anatomy, University of Western Ontario, London, Ontario. Wong JD, Sved AM. Maxillary nerve block anaesthesia via the greater palatine canal: a modified technique and case reports. Aust Dent J. 1991;36(1):15-21. Benninger B, Andrews K, Carter W. Clinical measurements of hard palate and implications for subepithelial connective tissue grafts with suggestions for palatal nomenclature. J Oral Maxillofac Surg. 2012;70(1):149-53. Jonnavithula N, Durga P, Madduri V, Ramachandran G, Nuvvula R, Srikanth R, et al. Efficacy of palatal block for analgesia following palatoplasty in children with cleft palate. Pediatr Anaesth.2010;20(8):727-33. Kang SH, Byun IY, Kim JH, Park HK, Kim MK. Three-dimensional analysis of maxillary anatomic landmarks for greater palatine nerve block anesthesia. J Craniofac Surg. 2012;23(3):e199-e202. Ikuta CR, Cardoso CL, Ferreira-Júnior O, Lauris JR, Souza PH, Rubira-Bullen IR. Position of the greater palatine foramen: an anatomical study through cone beam computed tomography images. Surg Radiol Anat. 2013;35(9):837-42. Attar BM, Far NF. Neurosensory changes of palatal mucosa following Le Fort I osteotomy. J Res Med Sci. 2009;14(5):269-75. Mellema JW, Tami TA. An endoscopic study of the greater palatine nerve. Am J Rhinol. 2004;18(2):99-103. Schwartz-Arad D, Dolev E, Williams W. Maxillary nerve block — a new approach using a computer-controlled anesthetic delivery system for maxillary sinus elevation procedure. A prospective study. Quintessence Int. 2004;35(6):477-80. Methathrathip D, Apinhasmit W, Chompoopong S, Lertsirithong A, Ariyawatkul T, Sangvichien S. Anatomy of greater palatine foramen and canal and pterygopalatine fossa in Thais: considerations for maxillary nerve block. Surg Radiol Anat. 2005;27(6):511-6. Epub 2005 Oct 15. Chrcanovic BR, Custódio AL. Anatomical variation in the position of the greater palatine foramen. J Oral Sci. 2010 Mar;52(1):109-13. Du Tolt DF, Nortjé C. The maxillae: integrated and applied anatomy relevant to dentistry. SADJ. 2003;58(8):325-30. Wang CP, Yang TL, Ko JY, Lou PJ. Ligation of the internal maxillary artery to reduce intraoperative bleeding during total maxillectomy. Laryngoscope. 2007;117(11): 1978-81. Garisto GA, Gaffen AS, Lawrence HP, Tenenbaum HC, Haas DA. Occurrence of paresthesia after dental local anesthetic administration in the United States. J Am Dent Assoc. 2010;141(7):836-44. Sved AM, Wong JD, Donkor P, Horan J, Rix L, Curtin J, Vickers R. Complications associated with maxillary nerve block anaesthesia via the greater palatine canal. Aust Dent J. 1992 ;37(5):340-5. Chávez-Lomeli ME, Mansilla Lory J, Pompa JA, Kjaer I. The human mandibular canal arises from three separate canals innervating different tooth groups. J Dent Res. 1996;75(8):1540-4. Bleier BS, Schlosser RJ. Endoscopic anatomy of the postganglionic pterygopalatine innervation of the posterolateral nasal mucosa. Int Forum Allergy Rhinol. 2011;1(2):113-7. Al-Din OF, Coghlan KM, Magennis P. Sensory nerve disturbance following Le Fort I osteotomy. Int J Oral Maxillofac Surg. 1996;25(1):13-9. Sharp JF, O'Grady G. Dehiscence of the greater palatine nerve. A risk factor in inferior turbinectomy? Clin Otolaryngol Allied Sci. 1993;18(4):253-6.